In order to create an exposure-corrected image from a set of observations, an exposure map has to be created for each observation (the exposure map is essentially an image of the effective area at each sky position, accounting for the effects of the telescope dither pattern which are especially important near the edges of the detector), and then combined. The merge_obs, reproject_obs, and flux_obs scripts wrap up all the CIAO tools needed to perform this task (they replace the merge_all tool, removed in CIAO 4.6). This thread is aimed at users who have multiple observations covering the same area of sky. A related thread is Making an Exposure-corrected Mosaic thread. To combine observations and create exposure-corrected image, or images. The Correcting Absolute Astrometry thread should be done before combining observations when needed. Last Update: 22 Dec 2014 - Review for CIAO 4.7. Added a link to the fine astrometric correction thread. 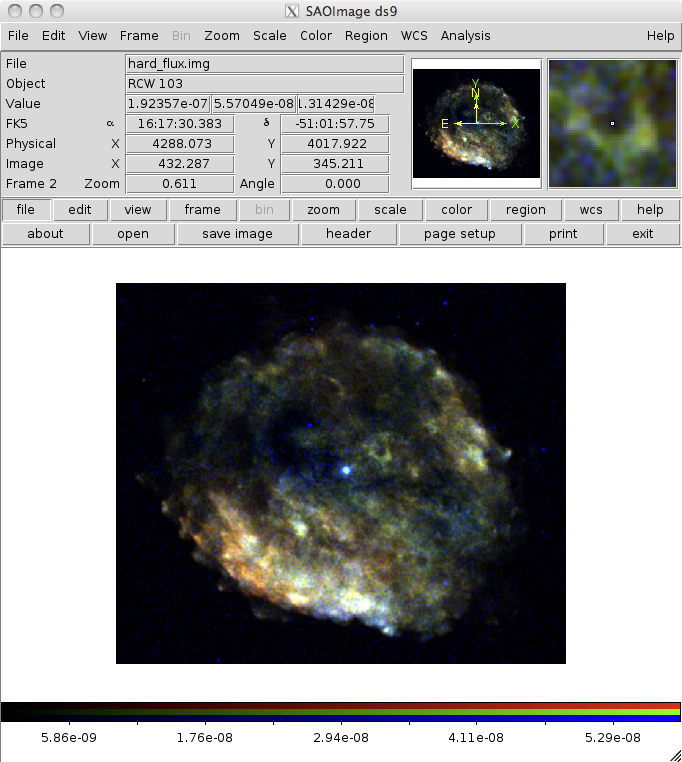 The merge_obs script uses all the necessary information available to create properly-calibrated exposure maps for the observations. That is, it includes the per-observation aspect-solution, bad-pixel, mask, FOV and DTF files (where relevent). In the following we supply the minimal information to merge_obs, namely the location of the event files (it searches for file names that contain the string evt in <dirname>/repro/ then <dirname>/primary/ then <dirname>/) and the output root. For ACIS data the default binning is 8 and choice of bands is broad (that is 0.5 to 7 keV with the exposure map evaluated at 2.3 keV). Note that the observations do not need to be listed in time order and that the script finds the locations of the ancillary files - e.g. aspect solution and bad-pixel files - it needs from the header keywords in the event files. 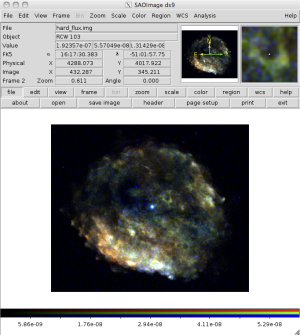 New tangent point: RA=16h 17m 40.368s Dec=-51d 1' 19.128"
Creating the fluxed images for 2 observations in parallel. The exposure-corrected image is shown in Figure 1. The exposure-corrected 0.5 to 7 keV image is displayed. Since the two observations had different roll angles the image is no longer a square. 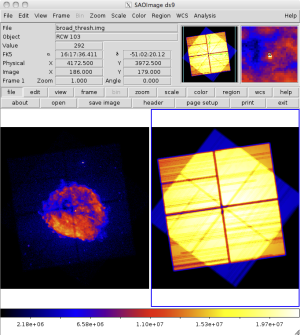 It can be compared to the "raw" counts image shown in Figure 2. 12224_reproj_evt.fits The reprojected event files. merged_evt.fits The merged event file (this contains only those columns that are common to all the reprojected event files). 12224_broad_thresh.img The counts image for each reprojected event file. If the expmapthresh parameter is set then these images have been thresholded to remove pixels where the corresponding exposure value is low. 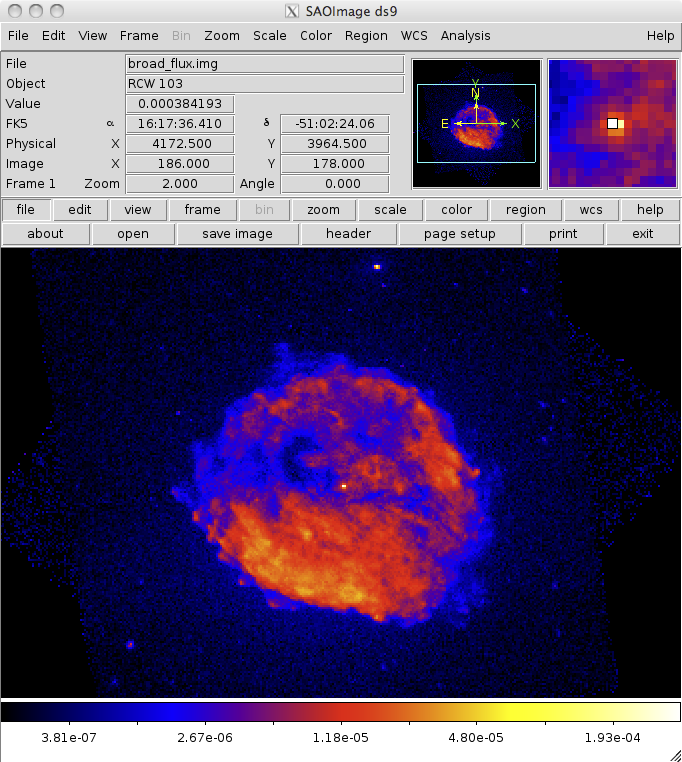 12224_broad_thresh.expmap The exposure map for each reprojected event file. 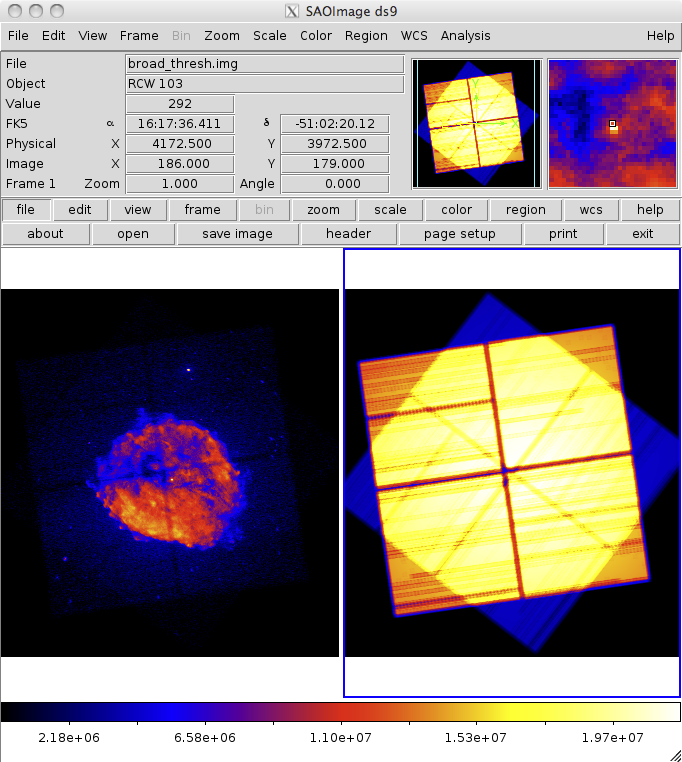 If the expmapthresh parameter is set then these images have been thresholded to remove pixels where the exposure is low. 12224_broad_flux.img The exposure-corrected image for each reprojected event file. broad_thresh.img The exposure-corrected image, exposure map, and counts image for the combined data. and the number of processors used by the script can be changed with the nproc parameter (by default, all processors are used), or even forced to use only one (by setting parallel to no). The merge_obs script allows you to create exposure-corrected images easily, but if you want to try different parameter settings (e.g. choice of bin size, location, or bands), then some of the work it does each time is wasted. For these occasions it can be useful to split the process into a reprojection stage - done by reproject_obs - and the calculation of the exposure-corrected images - done by flux_obs. and the output is the same as Figure 1 and Figure 2.
where the result is Figure 3. The image can be compared to that obtained using just one observation. depending on whether or not you want the exposure map and exposure-corrected image. Note that the files in evt.lis should not include any energy filter (the default band for ACIS data is 0.5 to 7.0 keV). If you wish to over-ride the script, e.g. to specify a tangent point or output grid, then you can. The following table lists the merge_all parameters and their equivalents in merge_obs; it does not describe those parameters that have no equivalent in merge_all. chip There is no equivalent parameter in merge_obs. If you wish to restrict the chips used then apply a filter to the input event files - e.g. infiles="@evt.lis[ccd_id=0:3]". expcorr The name of the combined fluxed image is either <outroot>/<band>_flux.img or <outroot>_<band>_flux.img, depending on whether the outroot parameter ends in a '/' or not. If you do not want to create the combined images and exposure maps then use the reproject_obs script instead, which just does the reprojection and merging of the event files. 15 Oct 2012 The thread has been converted to use the new merge_obs script, part of the 15 October 2012 scripts package release, rather than the deprecated merge_all script. The observations used in the thread have been changed. 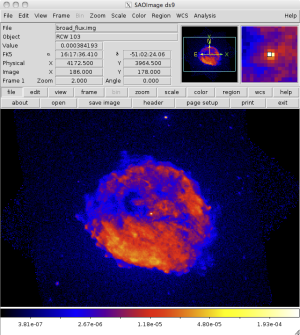 03 Dec 2013 Review for CIAO 4.6; the pbkfiles parameter has been removed from merge_obs; merge_all has been removed from the contributed package. 22 Dec 2014 Review for CIAO 4.7. Added a link to the fine astrometric correction thread.